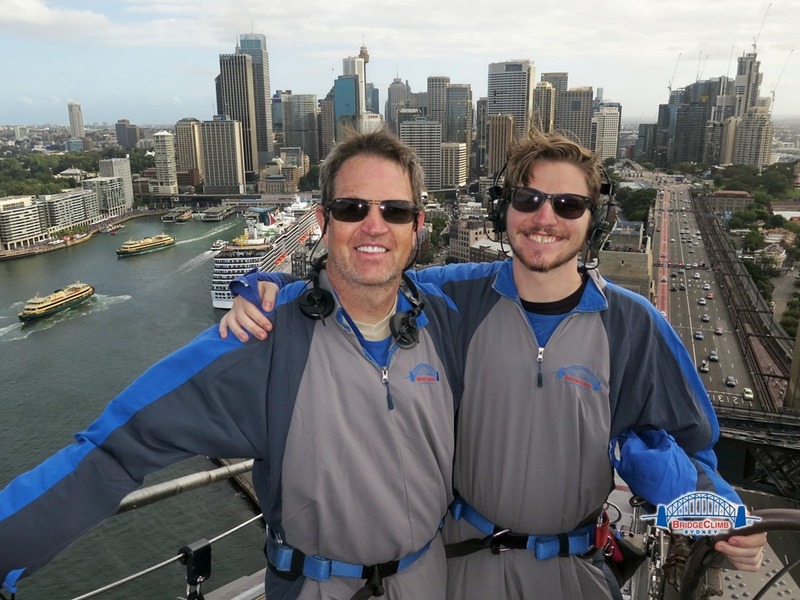 As I mentioned in a previous post, I had an opportunity to go to Australia at the end of 2015 to spend Christmas with my son. As with any trip I learned a bit about what I liked and what I would do differently next time I come down. The first thing I would do is spend more time here. I really only had 4 days to spend on activities as you loose (literally) the first day traveling (getting from Phoenix to LA, a layover then a 15 hours flight to Australia) and loose a day (but gain a calendar day) going back. The other thing I would do is get out of the city more. Although there is quite a bit to see in Sydney, I want to get into the country more next time and see what I envisioned Australia to be like. We did visit a few beaches (Bondi and Manley) and did the usual items like the Opera House, Darling Harbor, worlds largest IMAX, Paddy’s Market, Royal Botanic Gardens, Contemporary Art Museum and the water ferry system. We also walked about 10 miles a day and even got a good run in. Of the two beaches we visited, I prefer Manly because it has more space and has more variety of places to get food and drink nearby. We did visit Bondi on Christmas day so it was packed and all the restaurants there had all in one pricing as they had a captive audience. 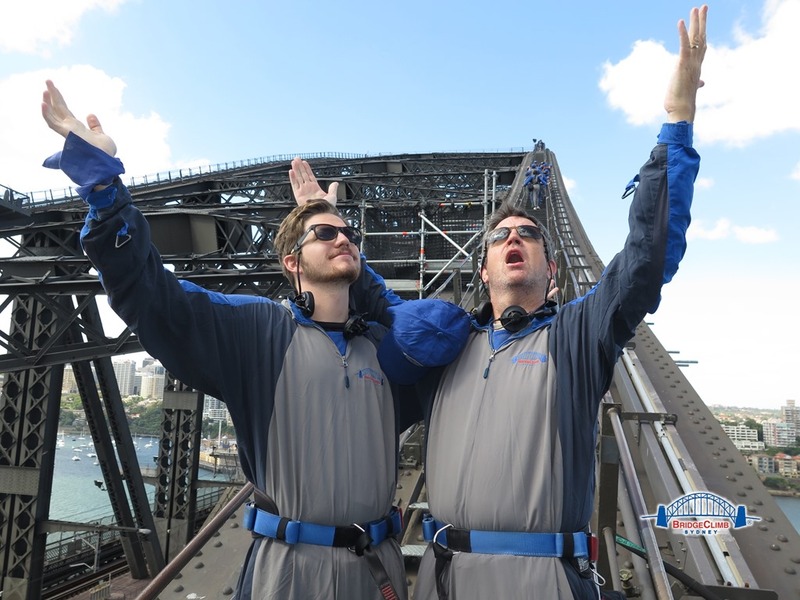 I was scheduled to leave Monday so we decided to do the Sydney Bridge Climb on Sunday late in the afternoon. Sunday turned out to be an overcast day which is OK as we overdid it and Bondi, and my Irish skin was cooked despite sunscreen on MOST areas. I highly suggest the climb, even if you are scared of heights. 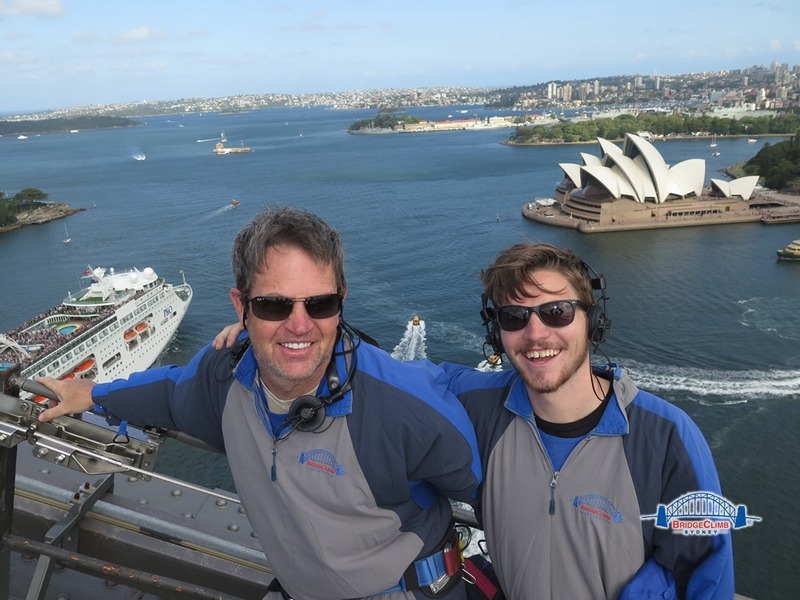 Matt is not a heights person, and I have been known to get the heebie jeebies as well, but after talking to a few locals on the ferry to Manly who are also scared of heights, they both agreed that as long a you don’t look straight down, it is one of the best experiences in the city. It is not cheap and as of this writing the cost is $293.00 per person Australian or $213 US per person after the conversion. We arrived about 15 minutes before our scheduled 3PM departure and ended up being two of the four Americans in the group along with a big family of 8 from Argentina. The other two Americans were high school aged girls from Santa Monica and Portland respectively visiting the California girls uncle who lives in Sydney. The thorough prep instructions and gear up session took almost 40 minutes from the time we walked in to the time we clipped on the guide cable for the start of our walk. 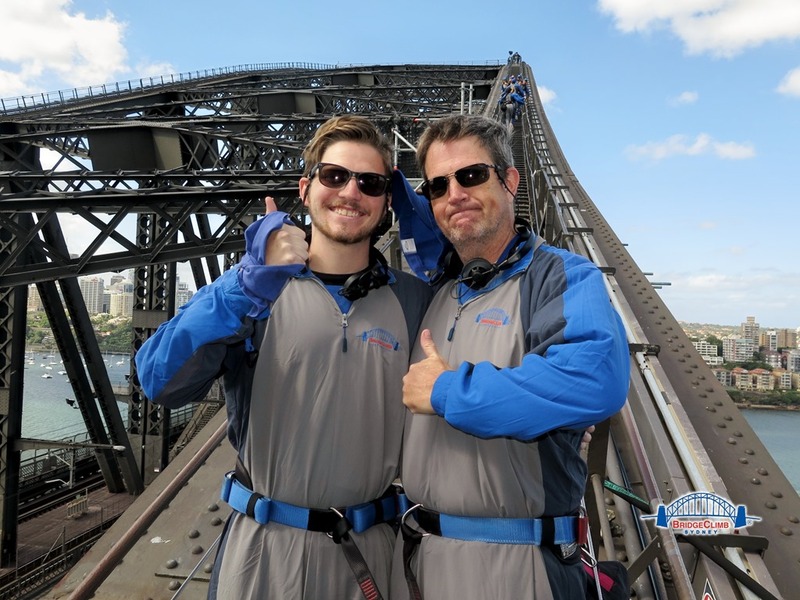 I wont give a step by step review, but let me just say, WOW, what an experience, and doubly so that I got to do it with my son. Unfortunately, my daughter and wife would never have been able to complete it because of the height, so it was good that we were able to take advantage of opportunity. We had a fantastic guide named Phoebe (smelly cat), who was very bubbly and knowledgeable about the history of the bridge and city itself, and there was not a question she could not answer. She was sure to include everyone in the conversations and her jokes (both good and bad) throughout the 2 plus hour climb and decent. one of the highlights for me was seeing one of the P&O cruise ships leave port and go right under us as we were almost at the top of the bridge. It really showed how high we were and how big those ships are. When we reached the top, the wind was whipping at about 35 kph which was a bit unnerving, but Phoebe said they still lead groups if the wind is 90 kph or less, so more than twice what we were feeling. One the way down Phoebe talked about the accidents and deaths that had happened during the construction of the bridge (only 16 over the 8 year project) and that only 3 actually happened on the steel. She purposefully waited till the down trip so as to not make anyone to nervous on the way up. When we returned to the equipment room to take off our gear, there we square holes in the wall that measured about 16 inches by 16 inches. All participants were to put their gear in the correct hole, like straps in one, kerchiefs in another and our pillow like fleece bundles on another. I decided to try a jump shot from about 8 feet away and the father of the Argentina group saw me may the motion and he put up his had to stop me and said “10 dollars you don’t make it.” I said ‘You’re on’. I proceeded to sink the shot which got his whole family whooping and laughing. I turned to him and said ‘that is 10 dollars US, not Australian’. He wanted to redeem himself so he suggested if he makes his we are even. I agreed, and he proceeded to brick it. USA, USA, USA. You cant beat a guy who grew up going to see Michael Jordan. I decided not to be ‘that guy’ (with some suggestion from Matt) and let him slide. After the climb, we walked back to Darling Harbor to meet two of Matts co workers for dinner by the water, some ice cream and one final walk back to the Westin before we turned in. We took a taxi to the Airport on Monday for our flight, breezed through security and gained access to the Quanta First lounge. This was my first ‘first’ lounge experience and I am now spoiled for all other travel. I have never had such a pleasant experience including full free breakfast, at any airport. Now I know is was not actually free, as getting to Executive Platinum had considerable cost to it, but just being handed a full breakfast menu with no prices on it was strange and a bit exciting. I am writing the rest of this from the plane, flight 72 back to LA. I was able to use my system wide upgrades to get business class pods for both Matt and I, so I am looking forward to getting some sleep on the 14 hour flight back. I know there has been some controversy on the availability of system wides and when they clear, but these two cleared for me 3 days before. I did need to call the Executive Platinum desk to get a system wide added to Matts reservation, but the rep was able to clear both of us all the way through to Phoenix. I would (will) go back at some point in the future and will use what I learned on this trip to make it an even better experience next time.